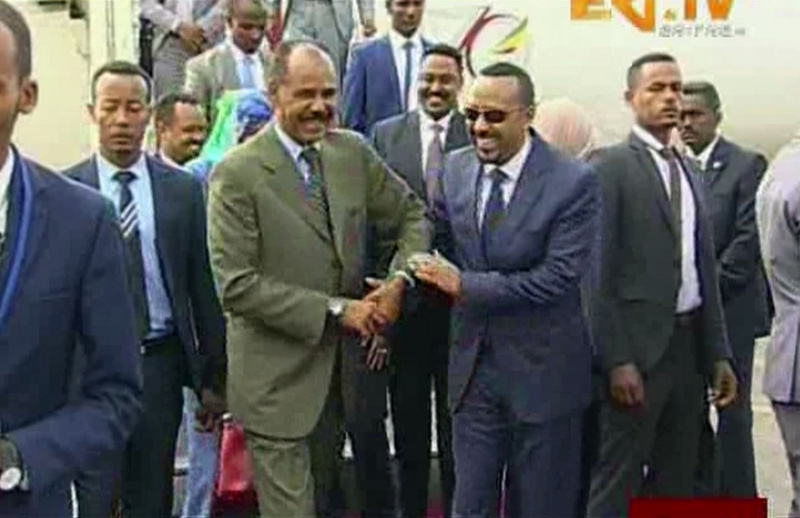 Ethiopian Prime Minister Abiy Ahmed, 42, and Eritrean President Isaias Afwerki, 72, also signed agreements to open embassies in their respective capitals, restore flight services and use port facilities in Eritrea. The signing took place in Eritrea's capital, Asmara, before Abiy flew back to Ethiopia. "The march toward peace might have been a long time coming but we have faith in the love and solidarity of our people," said Abiy at the signing. "We can now imagine a future where we see no national boundaries or high walls dividing us. The people of our region are joined in common purpose." Residents wasted no time in calling each other on the telephone. Many Ethiopians expressed their exhilaration on social media and changed their profile pictures to a photo of the Ethiopian and Eritrean leaders embracing, taken on Sunday. Ethiopia's reformist prime minister flew to Eritrea on Sunday was welcomed with hugs and laughter by Afwerki, a joyous scene unthinkable just months ago. The two leaders spoke of love between their countries and announced the end of the longstanding border war. "A state of war between the two countries has come to an end," tweeted Abiy's chief of staff, Fitsum Arega. The two countries have also agreed to implement a border decision that awards key centers to Eritrea. "Transport, trade and telecommunication ties will be resumed. Diplomatic ties and activities renewed," tweeted Fitsum. Flights will resume between the countries next week, according to Ethiopian Foreign Minister Workneh Gebeyehu. The regional bloc known for mediating South Sudan's ongoing peace talks, the Intergovernmental Authority on Development, lauded the dramatic diplomatic breakthrough between Ethiopia and Eritrea and praised Abiy for "wise and courageous leadership in ... normalizing relations between Ethiopia and Eritrea." It also said it looks forward to Eritrea rejoining the regional bloc and "taking its rightful place of collectively advancing peace and development in our region." Eritrea left the regional group a decade ago when accused the bloc of serving Ethiopia's interests. U.N. Secretary-General Antonio Guterres, who is visiting Ethiopia, endorsed the resumption of relations between the once warring countries, hailing the developments as "an amazing success! These kinds of developments give us hope."